11% Tax (8% Sales/Lodging + 3%Tourism Tax); Refundable Security Deposit $300/Extended Stays $500, extra fees for small pet and extra guests. CHECK-IN TIME: 3:00 p.m. & CHECK-OUT TIME: 11:00 a.m.
To complete registration, you will need to provide a current driver license, a picture of your car license plates, and a list of your guests. Base Cleaning Rate $150. Additional charges for additional guest and pets; $300 Refundable Security Deposit. Check-In Fees: $85 late hours 10 pm and after. 10% DISCOUNTS: Repeat Guests, Military/Veterans and California Credentialed Teachers, all memberships verified and not combined with any other offer. This stylish townhouse is professionally maintained with complementary WiFi and HDTV. Located in the hub of the Snow Summit Mountain Resort area at the Snow Summit Townhouse Estates, an 86-unit complex slope side with the lifts. BEARISTA is a newly remodeled unit and offers excellent space planning. It is an inverted floor plan with an upstairs stellar great room, vaulted ceilings, and full-sized kitchen and all the bedrooms down stairs. Comfortable furniture, 40-inch HDTV flat screen and dedicated DVD player. The dining room accommodates six guests comfortably. Kitchen Area: The kitchen is equipped with a new a Whirlpool Stainless Steel Suite which features a gas stove. Small appliances: Brita Water Filter Pitcher, Cuisinart Grind & Brew Coffeemaker, Oster Blender, Rival Crock Pot, Toastmaster Electric Carving Knife, Rival Electric Hand Mixer, Griddle Panini Sandwich Press, large turkey roasting pan, Oster Toaster Oven, and Cuisinart Waffle Maker. Master Bedroom: The master bedroom has a queen size bed, quality sheets, blackout drapes, and a 37-in. HDTV flat screen with a dedicated DVD player,. Guest Bedroom: The guest bedroom has a full bed, quality sheets, blackout drapes, and bunk beds for the children. A 32-in. HDTV flat screen with a dedicated DVD player. It accommodates two adults and two children. Upgraded spa toiletries and plush towels. The full bathroom is downstairs and the half bathroom is upstairs. The full bath has a Jack & Jill configuration and the bathing area has a spacious shower and soaking tub. The half bathroom is located upstairs with a stylish vanity and vessel sink. The laundry closet has full-size W/D and is located on the first floor. Ski Storage Locker: It is located outside of the front entrance. Keywords: Location, Location, and Location . . . 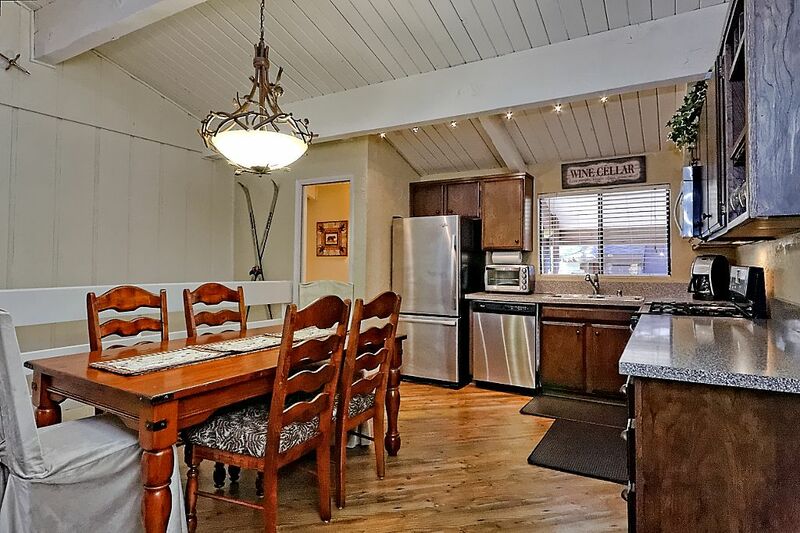 Spacious Mountain Condo, Snow Summit Mountain Resort, 1,088 square feet with a newly remodeled open floor plan. I am a retired educator from the Los Angeles area. I have a beautiful home in the South Bay and then added a Snow Summit Estate Townhome. So now I spend my time either at the beach or in the mountains. It is the best of both landscapes. Renovations is ongoing and I read all guest reviews. Since acting as my own renting agent, I have met so many nice people over the internet and telephone. And, I am glad to say that they enjoy my home as much as I do. This property is close by mountain life with a condo vibe. When you feel like a change, Big Bear Lake is a nice culture change from the beach. Just a short drive away from the LA area, we are able to come up and take advantage of the complete outdoor package. I hope that you will enjoy our retreat as much as my children and grandchildren. Our frequent trips from the Los Angeles area prompted us to purchase our own dream getaway. After much searching in Big Bear, we realized that location was the deciding factor in choosing our retreat. The advantage of being able to ski in/ski out to the lifts cannot be understated. If the convenience of the mountain and eating in is for you, then we welcome you to our Big Bear retreat. Full bath is located on the first floor. Half bath is located on the second floor. Mountain views from the living room balcony and from the front porch. NEAREST CHAIRLIFT/TRAM: Snow Summit Mtn. Resort, 3-min walk; 30-min shuttle runs between Snow Summit & Bear Mtn. ; NEAREST DOWNTOWN: The Village is a 10-min drive; NEAREST MOVIE THEATERS: The Village Theaters, two, in the village, 10-min drive; NEAREST SHOPPING MALLS: Von's/Stater Bros. is a 10-min drive; NEAREST FAST FOOD: Carl's Jr., a 5-min walk down Thrush Dr. NEAREST BIKE RENTAL: 10-min walk down Summit Blvd. Nearest Bowling Alley: 10-min drive to Village area. Thank you for your review. Location is as important to you as well as to me. A great location provides for a stress-free getaway upon arrival. It was a delightful experience to work with you and your family. Come back soon! Our whole experience was fantastic. We loved the location and the house was so lovely - we felt right at home and really appreciated how updated, clean and organized it was. The owner was really easy to work with - super responsive and accommodated our request to stay past check out time. We also really appreciated how close the place was to Snow Summit as well. All we had to do was walk across the small parking area. When our son was taking ski lessons, I went back to the place and took a nap. No need to deal with the car or parking. Overall, I would highly recommend this place. Thank you so much. Location, location is the most important ingredient to my guests. They have easy access to the slopes and can spend quality time doing what they love best. I look forward to have you back again! This was such a perfect place for our family to stay......We wanted CLEAN, walking to slopes, spacious! Patricia has done a wonderful job making sure everything was all the above!!! Thank you for taking pride in your rental space and making sure its standards are high for us renters!! I will definitely consider renting here again!! Thank you. I enjoyed working with you. You were so efficient in your responses and any follow up. My vacation townhouse is clean and well kept as I want my guests not to be disappointed. The pictures you see on the website is exactly what you get. My guests deserve a perfect stay from the moment they book a reservation with me. So close to the slopes . Feels like a home! Thank you so much. I am glad you enjoyed my warm home as your own. You were the perfect communicator from beginning to end. Come back soon! We had a great long weekend vacation at this condo. It was a very busy weekend so we were so happy that we only had to walk across a parking lot to get to the lifts at Snow Summit. The condo was cozy and very comfortable and had everything you need. We only wished there was a sled somewhere in the condo when it snowed! Thank you for being such gracious guests. Thank you for the good idea and consider it done! Come back soon. We came here over the President's weekend, we arrived late having driven through a storm and were a bit stressed...we immediately calmed down once we entered into this ideally located condo - immaculate, well-equipped and nicely decorated. The host was so helpful in her advice pre-arrival and was very accommodating while we were there. I would most certainly highly recommend this rental. Thank you so much. You and your guests were the perfect guests. By chance, you picked the most challenging weekend of the season thus far, and your family still managed to make it the perfect holiday. The location is the best as described and once you are here "you are here". Come back soon! There is no refund for canceled reservations during the winter season; you may reschedule your reservation. Base Rates are for four guests or less; additional charges for additional guests. Rates are subject to change at anytime. Check-In Time: 3:00 p.m./Check-Out Time: 11:00 a.m. Base Cleaning Fee $150. Dogs are optional with a $40 Pet Fee and a $150 Pet Security Deposit/Refundable. Dog restrictions are weight (40 pounds or less) and breed (non agressive breeds only).